These two Seoul attractions will keep your crew amused in the best way possible. Alive Museum will bring out the best in you and your Instagram feed. Dynamic Maze will test friendships and bonds in a manner that's incredibly exhilarating. Don't let other people have all the fun. Tickets for each attraction cost ₩12,000 (around ₱580 or $11) per head. If you'll visit both the museum and maze, you can get a package pass for only ₩18,000 (around ₱1,126 or $21). For your convenience, booking instructions are found below. If you want a truly unforgettable South Korea trip with your partner, friends, or family, you should visit these two unique attractions: Alive Museum and Dynamic Maze. These two sites offer an out-of-the-box experience whereby everyone gets to try the most peculiar things and just be crazy. To give you a quick background, the museum and maze are developed by Creative Tong, which is a company that prides itself as the #1 Global Creative Contents Group. This means that they do one thing excellently: to play with their visitors' imagination in a very dramatic way. Their concepts had become so popular that they've expanded their business in China, Singapore, and Indonesia (among others), and they even have plans of opening a zoo and an aquarium in the future. 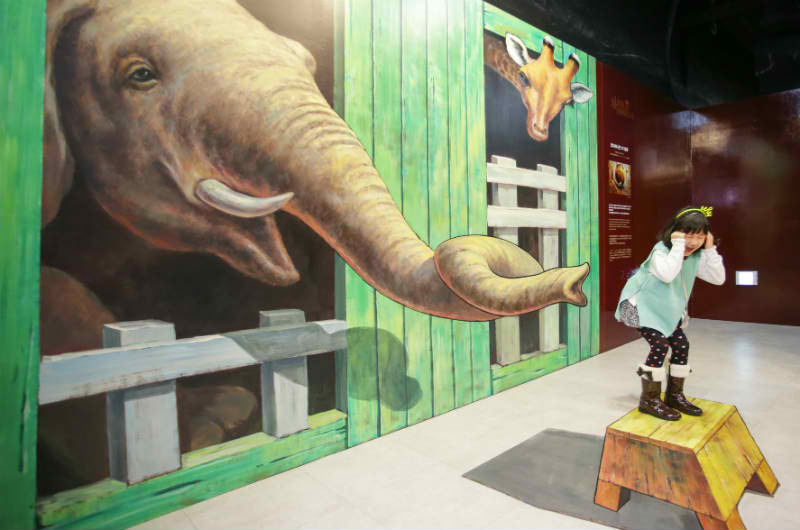 Creative Tong's top attraction is the Alive Museum, which is a temple of optical illusion art. It houses artistic and curious exhibits, which are meant to be felt, inspected, and snapped. The idea is for you to interact with the displays and strike a pose as if you're a part of it. Only in your photos will you discover the undying magic of the place. Filled with over a hundred interactive art pieces and digital displays, you're sure to be transported to the most curious, exciting, and awkward places. Be sure to get your phones and cameras ready; Alive Museum is a photo buffet! Dynamic Maze has multiple locations in South Korea, and each one has an episode or level to beat. In Insadong, you will get to play the Episode 1 called Haetae's Attack. As the title suggests, the mission requires solving the mystery puzzles of legendary Haetae, a mythical lion-like creature often associated with justice. Are you ready to get in the maze? PRICE: ₱580 or $11, if not discounted! There is a minimum admission requirement of 2 persons. PRICE: ₱1,126 or $21, if not discounted! For Dynamic Maze, there is a minimum admission requirement of 2 persons. PRICE: ₱1,941 (24hr Pass) and ₱2,657 (48hr Pass), if not discounted! With Discover Seoul Pass, you will get free admission to Alive Museum and 20+ more locations! You will also get an automatic discount of ₱145 or $2.8 when you present your Discover Seoul Pass upon offline (over-the-counter) purchase of a Dynamic Maze ticket. When visiting these two attractions, take your partner, friends, and/or family. If you're a solo traveler, find someone from your hostel whom you can tag along with! Taking a selfie in Alive Museum will not be as fun and fulfilling. Minimum 2 persons are required to gain admission. Haetae is too strong for any individual! There's also a minimum height requirement of 3 ft and 6 in (110cm). You will not be able to reserve the time for your visit. Everyone must wait in line, especially on weekends. Ticket is for one-time use only. Re-entering is not allowed. No food, drinks, or pets allowed inside. Both the museum and maze are located in Insadong, which is a known culture district and tourist attraction in Seoul. By Subway (Line 1, Blue): Get off at Jonggak Station Exit no. 3. Turn left at Geumgangjehwa Intersection and head on straight for 300m. The museum is located on the right. By Subway (Line 3, Orange): Get off at Anguk Station and take Exit no. 6. Walk straight for 150m on the one-way street of Insadong. Click on the following to check the (discounted) rates offered by Klook: Discover Seoul Pass, Alive Museum, and Dynamic Maze. 1 hour for each attraction. Call 1544-8506 or check out Alive Museum's website here and Dynamic Maze's website here.